Darwin Port facilities are growing rapidly, the East Arm Wharf and connecting rail to Adelaide providing an important link to Asia and offshore oil and gas developments. The original Darwin Wharves are still used for smaller ships and tourist cruise ships, however the next decade promises to see major development at the new East Arm area as new inland mines and Timor Sea natural gas reserves come on stream. At a recent conference the NT Government made it's support for projects such as Inpex's development of the Ichthys LNG field clear and the sheer scale of this $20 billion project will have a major impact on Darwin in the next few years. As many as ten offshore reserves have been identified so far and as they are developed Darwin will become a major Marine Supply Base, centered around the East Arm industrial area. Both onshore processing and floating LNG technology will be used to develop these fields. A new 20 hectare Common User Area has been allocated to provide support for engineering, transport, mining suppot and other industrial activities. 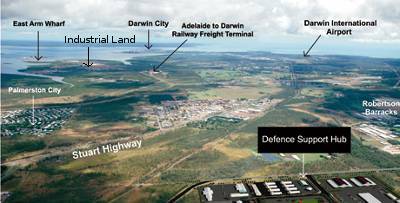 The Land Development Corporation has also released more serviced and landscaped lots adjacent to the Darwin rail freight terminal and close to the Port to allow for this anticipated growth. The challenge for Darwin will be to supply the infastructure, housing and public facilities that will be required to support this growth over the next few years. Return from Darwin Port Development to Enjoy Darwin Home.